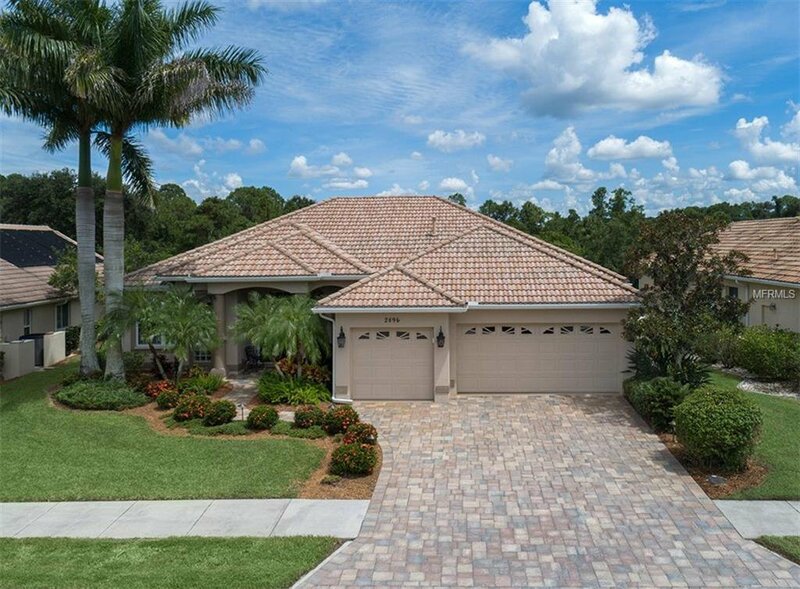 Magnificent custom 3 bedroom, 2 bath, 3 car garage "Tortola" Model home with natural golf course landscape offering the owner with both privacy and Golf course view. Architecturally beautifully designed with Tuscan columns that lead to a portico front entry with welcoming double doors. Home offers fine custom features to include: Chef kitchen with granite counter tops, 43" solid wood cherry cabinets, stainless appliances, wet bar and built in dining room buffet, tile flooring, wood laminate in the bedrooms, roman showers, extensive crown molding, tray ceilings, aquarium window, plantation shutters and much more. Energy efficient natural gas water heater. Enjoy the soothing sound of the fountain as it flows into the large heated pool surrounded by pavers and cage with picture window. Diamond grid lock tile flooring in garage. Complete hurricane shutters for peace of mind. Community offer guarded security gate, maintenance free living, Golf & Country club living with fine dining, social activities, community resort style heated pool/spa, tennis courts, fitness center, and 27 hole championship golf course. Easy access to dining, shopping performing arts center, I-75, area Beaches and soon to be the home of the Atlanta Braves training stadium. Listing courtesy of COLDWELL BANKER RESIDENTIAL REAL ESTATE. Selling Office: CHAMPION REALTY SERVICES, LLC.